At Whitehats Design, we offer highly customizable CMS website design and development services. At Whitehats Design, we create value for money content management system designs. The idea is to provide you with more affordable services than our competitors. Our CMS services in Dubai are aimed to give you complete peace of mind while delivering the projects within assigned deadlines. We only rely upon capable and experienced team of designers and developers. There are many reasons why Whitehats Design offers CMS based web designing and development services. The first and the most important reason is that CMS provides more functionality than custom based websites. You can use plugins, modifications and other add-ons which directly improve website’s efficiency and appearance. Thousands of volunteers work on CMS based platforms to improve their security and provide regular updates against security vulnerabilities. Talk about any CMS, you will find hundreds of thousands of websites offering free and paid themes. We can easily choose a theme of your choice and develop a website around it. At Whitehats Design we have hired some of the most well established CMS designers who have years of experience working on WordPress websites or others created using any of the content management systems. When you get Whitehats Design team onboard, you do not need to worry about the quality of web designing services delivered. Customer needs are the most important element of our web designing service. Whitehats Design uses jQuery to develop more interactive websites by adding some of the trendiest transition and animation affects. By using jQuery we add sliders which provide you with the real animation feel while still ensuring that the web pages have quicker page load speed times. The level of interactivity that can be achieved using jQuery is matchless. Besides using the jQuery in website design, Whitehats Design team also deploys it to develop standalone single page web applications using different frameworks. A major benefit and the main reason why our customers come to us for WordPress website design and development services is improved control over the content. It is easy to get a custom website developed but you need a proper developer who knows the development language’s syntax to update the content. As a non-tech savvy person you will not be able to make the changes by yourself. When you get CMS based website designing services, you will be given a WYSIWYG (What You See Is What You Get) interface through which you can update the content without any external assistance, giving you full autonomy and control. When it comes to functionality, you need to ask your developer to add everything that comes to your mind. Every time you need to remove, add or modify some add-on you would have to pay to your developer or designer for that. On the other hand, when you go for a CMS based website, you do not need to go to the developer every time a change is needed. 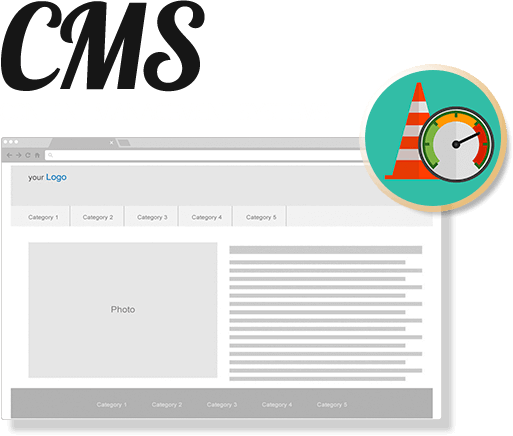 You can make the modifications by yourself or ask any developer with basic CMS knowledge to do the changes for you. At Whitehats Design, we make sure to keep adding support for more content management systems. We choose those content management systems that provide our customers with the kind of flexibility they require to build websites for their businesses. Similarly, we also aim to include Content Management Systems in our development services that are secure to use. WordPress is known world over as one of the leading content management systems used globally. There are many useful features offered by WordPress. We are a Dubai based CMS design company that offers all kinds of theming options. Our capable designers and developers work in close collaboration to ensure that your projects are delivered as per your specific requirements. WordPress gives you complete freedom of usage and it has been supported by thousands of themes. You can also add more functionality by installing plugins that a non-technical person can also do so without any external assistance. Joomla offers great functionality and extensibility for different types of websites. We can help build Joomla websites for corporations, online magazines, ecommerce, online reservations, non-profit organizations, schools, and church websites among others. Many important organizations in the world are already using Joomla. There are many advantages of having a website designed and developed in Joomla. It allows business organizations to make changes, updates and modifications to their website or content very easily. We can build custom extensions which would match your specific business needs. Magento is a supported by strong backend. This ensures that all your business needs have been fulfilled without compromising on security. You can order us custom Magento websites that our designers and developers would deliver as per your requirements. Let us help you build a custom theme that represents your own brand. Every phase of the designing and development is evaluated carefully before the actual work starts. Get a Magento CMS based website and reap all the benefits that comes by-default with it. Drupal is another famous content management system used by different types of organizations including global enterprises, governments, education institutions, and NGOs. It provides you with the desired flexibility and is highly scalable. You can use Drupal for single websites or share content in several languages. We help business organizations transform Drupal into powerful digital solution that is already backed by an innovative open source community. One of the advantages of Drupal is that you can easily use it for ecommerce purposes because of the support offered by product marketing solutions. Drupal helps you easily attract and convert online shoppers into customers. It provides businesses with the perfect blend of content and commerce. OpenCart is another amazing CMS choice that we provide to our customers. It does not only support the CMS functionality but also help you build reliable ecommerce websites. The idea is to develop business optimized websites that provide your visitors with all the required information. It also offers many useful extensions that can help you further customize the utility of your website. OpenCart also provides many useful SEO optimization features to help you attract organic website traffic. MODX offers greater creative freedom to website designers and developers. By using MODX we can bring you high end website design and development services. It offers you exceptional control over content of your website. Our website designers will ensure that when installing MODX, no stone remains unturned to deliver exceptional quality user experience. MODX designed websites also provide you with great flexibility and many other customization options. Prestashop is not just another CMS but also backed by ecommerce shopping cart. It is open source and can be customized as per your requirements. We recommend Prestashop to our customers because of its scalability and modular structure. It is very lightweight and ensures that your website’s response time to visitor requests is very fast. Our PHP developers can help you create Prestashop based themes within no time. You can easily setup you front-office using Prestashop. It supports several payment methods and as many categories or subcategories as you would like.